This entry was posted in Randy's blog entries on November 5, 2018 by randy. All successful organizations and companies have a system — a system that they follow – throughout the organization. 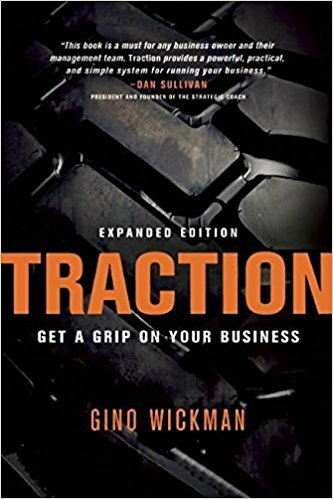 Traction is a book that provides a usable, transferable, implementable system for companies aiming for success and growth. a true system: do this, and then this, and then this, in this order, consistently, and this good stuff will likely happen. This system is called the EOS System (the Entrepreneurial Operating System). This book is the first part of a comprehensive system complete with forms, coaches, long-term connections to help a company move forward effectively. A surprising number of people who attended our event are using Traction’s EOS in full or in part. One Traction coach came to hear my synopsis. And, I came away from my reading of the book, and from a few conversations, thinking this is a really useful operating system. #1 – We need to be reminded of the basics of being a business. This books reminds us of these basics. #2 – Each business needs a usable system: to plan for the future, to get all things done, and to make sure nothing falls through the cracks. This book provides such a system. #3 – We all need to know what to do at work – individually, and as part of the larger team. This book is a very good “this is what needs to get done; this is what you need to do” book. In summary, successful businesses operate with a crystal clear vision that is shared by everyone. They have the right people in the right seats. They have a pulse on their operations by watching and managing a handful of numbers on a weekly basis. They identify and solve issues promptly in an open and honest environment. They document their processes and ensure that they are followed by everyone. They establish priorities for each employee and ensure that a high level of trust, communication, and accountability exists on each team. Keeping people around just because you like them is destructive. The marketing process is the way you get your message to your target audience and generate interest in what you do and prospects for your salespeople. …The sales process is the way you convert a prospect into a customer. 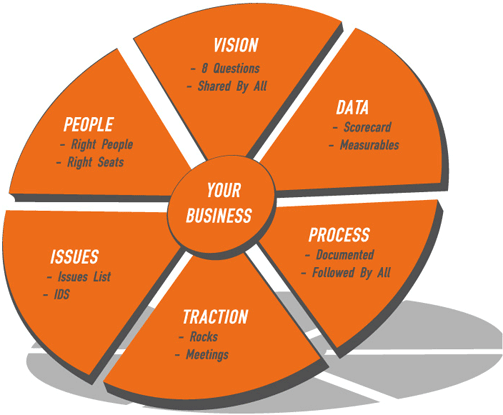 The operations processes are the way you make your product or provide your service to your customer. …The accounting process is the flow and management of all monies coming in and going out. Don’t think that your company will get better simply because you’ve read this book or attended an EOS session. You’ll still need to do the work. #6 – People – Right People; Right Seats — Core Values + People Analyzer = Right People — The right seat means that each of your employees is operating within his or her area of greatest skill and passion inside your organization and that the roles and responsibilities expected of each employee fit with his or her Unique Ability ® — That leads us to the Accountability Chart, the ultimate tool for structuring your organization the right way, defining roles and responsibilities, and clearly identifying all of the seats in the organization. — Unique Ability ® + Accountability Chart = Right Seats — The right people always:Get it; Want it; have the Capacity to Do It! And, I am a real fan of using paper! So is this author: Put it on paper – put everything (important) – especially all the components of your system — on paper! — Entrepreneurs must get their vision out of their heads and down onto paper. What is your core focus? — Niche = Core Focus — Once your core focus is clear, your people, processes, and systems can be put in place to drive it with consistency. What are your issues? – Identify and Solve your issues, with an Issues List; and following the Issues Solving Track – Identify, Discuss, Solve (Solve leads to a specific action item. for someone specific). — Beware of (be very wary of) of Tangents! STEP 1 — your leadership team lists everything on the whiteboard that has to be accomplished in the next 90 days. STEP 2 With that list of 10 to 20 items in front of you, discuss, debate, and determine the most important priorities for the company in the next 90 days. STEP 3 Once you’ve narrowed your list, set the date that the Rocks are due. STEP 4 Assign who owns each Rock. STEP 5 Once the company Rocks are set, the members of the leadership team each set their own Rocks. Step 6 Create the Rock Sheet, which is just a landscaped piece of paper. STEP 7 Share the company Rocks with the entire organization. STEP 8 Have each department set their Rocks as a team. (STEP 9 — In the end, each employee will have his or her own Rocks for the quarter). And, successful companies have meetings. They follow a “meeting pulse.” Some thoughts about all these meetings — you need them; keep them human (the author describes the power of the “segue” moment – where each person talks about something that was accomplished, or went well – at work, and/or in your personal life); basically:review (scorecard review; rock review), reset (your rocks) and solve problems; someone has to manage the agenda – AND!!! begin and end on time!!! #1 – This system is like taking your vital signs. Take them regularly; make sure you are healthy. #2 – This system helps everyone know what to do; when to do it; and how all that is done helps the overall company reach its goals. #3 – This system helps everyone know if that person fits here; how that person fits here – or, if that person simply is not a fit here. #4 – This system reminds everyone that “someone” always needs the regular meetings. Thus, the team, the company, needs the regular meetings. #5 – This system reminds us all that success requires work. Meaningful work; fulfilling work; but, work. 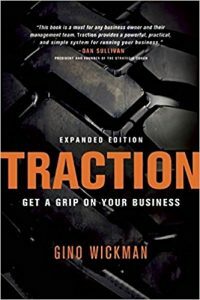 Should you read Traction? If you lead an organization; if you work in an organization: Yes. Is reading it enough? Nope! But, it is a start. Then, you have to put the ideas to work. That may require a trained EOS coach. (Google it – they are easy to find). There are other “systems.” This system gives plenty of credit to the Rockefeller Habits introduced by Verne Harnish. But, choose a system, whether this one or another, and get everybody on board; everybody! Adopt the common vocabulary of the system you choose. And then, get to it! There is building to be done! Excellent review–as always. The 90-day “rock” organization is an idea I want to pursue.